IDF soldier sent to military prison for growing beard during Omer will be released to be with his family on Israel's 70th. An IDF soldier from the Kfir Brigade who was given 20 days in military prison after growing a beard for the Omer-counting period will be released to celebrate Israel’s 70th birthday with his family. 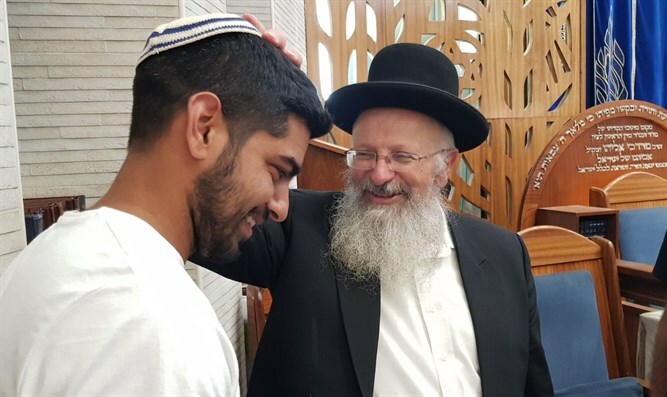 The brother of the combat soldier arrived Monday to meet Rabbi Shmuel Eliyahu in Jerusalem, and Rabbi Eliyahu conveyed a message of encouragement to the soldier, who will continue to serve his sentence after Independence Day. The soldier was sent to prison for growing a beard during the Omer, as only “religious soldiers” are entitled to an exemption from shaving. The soldier's commanders explained to him that growing a beard constitutes refusal to obey an order, and therefore he was tried and sent to 20 days in prison. “We welcome the Chief Rabbi of Tzfat and member of the Chief Rabbinate of Israel, Rabbi Shmuel Eliyahu, for encouraging this holy community, and call on the Chief Army Rabbi to act in a similar spirit. "